So im having a super hard time keeping things like netting and the hanging coconut bridge from falling off the glass. I tried command strips, humidity approved command strips, doubling up command strips, hook type suction cups, command stripping said suction cups.... The coconut fell in the middle of the night, and half the netting the other day. Surfaces were pristinely cleaned. I just dont get it. What am i doing wrong? Any suggestions? Ready to go in with my glue gun.... ugh. Think im gonna try a different brand of suction cups. I was sitting here deep into Netflix and had an "ah-ha" moment and rigged the coconut to the center beam. But still questioning the net issue. Did you throughly dry the surface beforehand? (Or is the surface your trying to stick things on in front of the UTH, which is warm and prone to things falling off? Ok, so yes the area is clean, and... yes, i am trying to stick to a warm surface is that my problem right there? elly_bananas wrote: Think im gonna try a different brand of suction cups. I was sitting here deep into Netflix and had an "ah-ha" moment and rigged the coconut to the center beam. But still questioning the net issue. I’m not sure if this will help, or if they come in smaller sizes. I have these suction cups that have a hook and you place it on the glass with the hook up then push the hook down and it creates a really tight seal. here is what they look like. I use them on my front porch to hang decorations up. I hope I explained them ok. I read you can silicone suction cups to tile, wonder if that would be ok in a tank? RiNiKy506 wrote: I’m not sure if this will help, or if they come in smaller sizes. 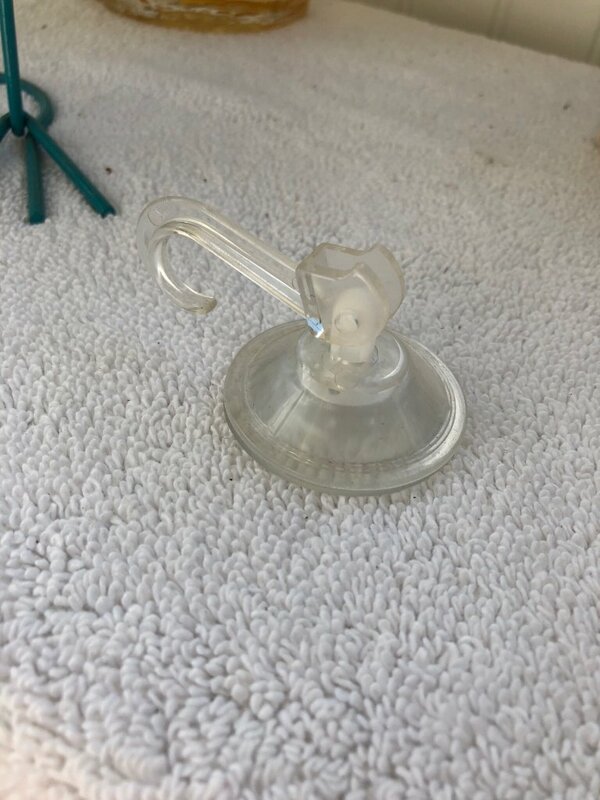 I have these suction cups that have a hook and you place it on the glass with the hook up then push the hook down and it creates a really tight seal. here is what they look like. I use them on my front porch to hang decorations up. I hope I explained them ok. The coconut hut is probably heavy, which is why some things aren't working. Sorry that you are having issues. You might need to use a zip tie to attach it to a branch or the center beam like you mentioned. Edit: Sorry, I forgot you mentioned the net. I use the velcro command strips. Then I use the hooks with the velcro. I don't use anything to clean my glass but a paper towel. I wipe the glass really well with the paper towel. Then, I push command strip on with the hook and press it for a good 10-20 seconds. Then, don't hang anything on it for 5 minutes. After that - then you can hang it. This is what I use in my crabitats besides zip ties. Works for me, and my humidity is at 99% I do not mist my tanks though. If you mist your tank, this could be the issue. Good luck!